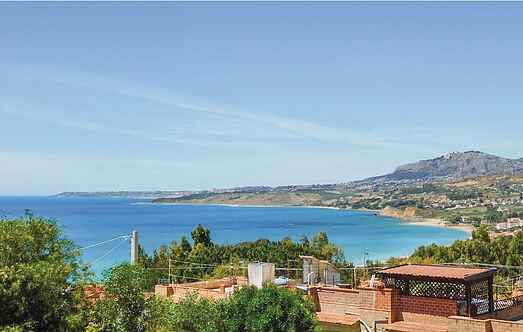 Find a vacation home to rent in Sciacca from our list of vacation rental properties. Campaya has over 29 vacation homes available in Sciacca, which give you the possibility to locate a unique accommodation in Sciacca which completes your check-list in search for the perfect self catering vacation apartments in Sciacca or vacation villas in Sciacca. This holiday apartment is located near Sciacca on the south-west coast of Sicily, only 500 m from its famous beaches. The open terrace is ideal for outdoor dining. Terraced house for holidays, 3.5 km away from Sciacca, in a residential complex with a beautiful sea view. Holiday apartment in an apartment complex, with outdoor space equipped with barbecue, gazebo, sun loungers and tables. Cosy apartment inside a residence in the residential area of Sciacca, Sicily. In the terrace you can enjoy your meals alfresco while appreciating the view over the beautiful sea. Comfortable apartment for holidays on the first floor in a residence located in the San Calogero Sciacca area. It is equipped with everything to make your holidays enjoyable. Holiday house in the seaside area near Sciacca (8 km). The accommodation is on 2 levels, living area above and rooms below. There is beautiful outdoor space with sunbathing area. Holiday apartment in a residence located in the San Calogero Sciacca area. Furnished in a simple way and equipped with everything to make your holidays pleasant and comfortable. Immersed in a residential context at about 5 km from the historic center of Sciacca, this beautiful holiday apartment is on the ground floor of a renovated house, with private entrance. This holiday apartment is located near Sciacca on the south-west coast of Sicily, only 500 m from its famous beaches. Holiday apartment in a residential area with independent entrance and all the comforts for a relaxing seaside holiday. This apartment has been carefully decorated by the owners. Holiday apartment in a residence located in Sciacca, in the Agrigento district. Shared among all guests: barbecue, solarium, whirlpool and equipped outdoor area.